Within a Microsoft SQL Transactional Replication setup there is a method to capture Commands in Distribution. 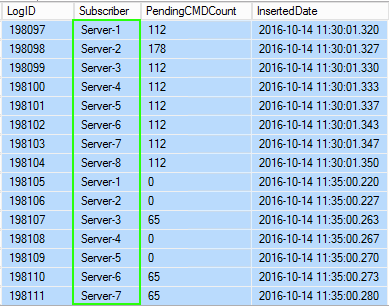 These are commands in the Distribution DB that are marked as pending transmission to the designated Subscribers. It is possible to log this data and then report on it using an Aggregated Pivot Query. The query example is below using raw data and pivot data.